Are you looking for a versatile, athletic and attractive crossover that checks all the boxes? 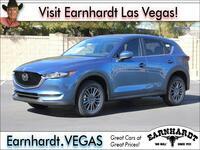 Look no further than the 2017 Mazda CX-5 in Las Vegas, NV. A fan favorite in the compact crossover segment, the Mazda CX-5 promises a nimble drive and athletic style that will take your day-to-day commute to the next level at Earnhardt Mazda Las Vegas. After a complete redesign that upgrades style, ride quality, technology and features, the 2017 Mazda CX-5 is more attractive than ever. New and improved 2017 Mazda CX-5 models are available in four trim levels – Sport, Touring, Grand Select and Grand Touring – that will start at just $24,045. An updated design promises a more dynamic style and a series of upgrades that create a smoother, quieter drive when you get behind the wheel. With room for five passengers and an impressive 30.9 cubic feet of cargo space behind the second row, the Mazda CX-5 is perfect for your next family adventure. What's New for the 2017 Mazda CX-5 Design? A complete redesign, makes the 2017 Mazda CX-5 in Las Vegas, NV more attractive than ever and dynamic performance is a trademark of the Mazda-brand crossover. Performance is derived from a 187-horsepower SKYACTIV®-G 2.5-liter four-cylinder power core. Married to a standard six-speed SKYACTIV®-DRIVE automatic transmission with manual-shift and Sport Mode, the front-wheel drive Mazda CX-5 will make 24 mpg in the city and 31 mpg on the highway. Equipped with all-wheel drive, the Mazda CX-5 still makes 23 mpg in the city and 29 mpg on the highway and promises improved performance. With much more to offer than an athletic drive, the 2017 Mazda CX-5 is loaded with innovative features and technology at an affordable price. Entry-level Mazda CX-5 Sport models employ 17-inch wheels, LED headlights, premium cloth interior, a rearview camera and a seven-inch MAZDA CONNECT™ touchscreen display with Bluetooth capabilities. Touring models add a wealth of technology that includes keyless ignition with push-button start, heated front seats, synthetic leather interior, dual-zone automatic climate control and advanced safety systems. Available Grand Select and Grand Touring grades pull out all the stops with a moonroof, power liftgate, Bose® sound system, a heated steering wheel and much more. 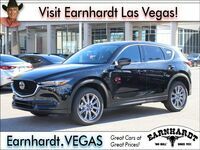 Visit Earnhardt Mazda Las Vegas today to get behind the wheel of the 2017 Mazda CX-5!